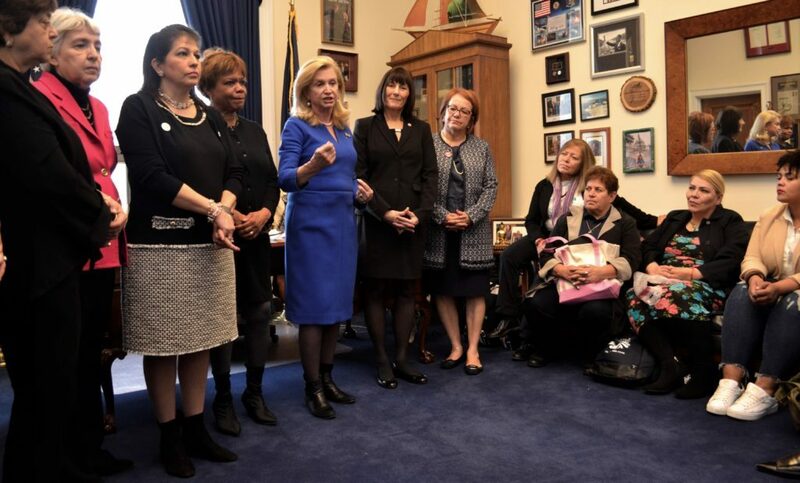 Congresswoman Carolyn B. Maloney (D-NY) joined today with leaders of the Enough is Enough movement, a coalition of women’s groups dedicated to ending sexual violence, to push for an end to sexual harassment. Rep. Maloney is the sponsor of HR 4729 Ending Secrecy About Workplace Sexual Harassment Act, HR 4748 No Tax Deductions for Sexual Harasser Buyouts Act, and HJ Res 33, the Equal Rights Amendment. The Enough is Enough Movement is led by coalition partner groups including the National Organization for Women (NOW), Feminist Majority, National Congress of Black Women, UNITE HERE, Alianza Nacional de Campesinas, Legal Momentum, and National Council of Jewish Women. “Enough is enough; women cannot and must not be forced to continue to suffer in silence. Our message is clear; when it comes to sexual harassment, sexual assault or gender-based discrimination at our place of work and everywhere—time’s up,” said Congresswoman Brenda Lawrence (D-MI). I am encouraged that with dedication and relentless pursuit, we can change this hurtful and harmful workplace culture. No one should ever have to endure sexual harassment in their place of work, and we are here to make the strong statement that harassment, intimidation and unwanted advances cannot and will not be tolerated. “Beyond just the workplace, we cannot leave out students and educational institutions when we’re talking about rampant sexual harassment and assault,” says Eleanor Smeal, president of the Feminist Majority. “One in five women students are survivors of campus sexual assault. The movement on campuses, led by student activists, is growing and cannot be ignored.